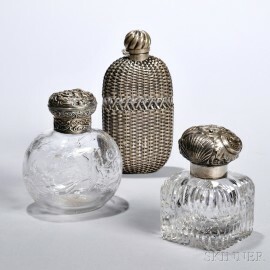 Three Sterling Silver-mounted Colorless Glass Items, an inkwell with shell and scroll cast silver lid, ht. 4 1/4, an English Victorian perfume bottle with cut-glass motif of birds among floral sprays, silver marked for William Comyns, ht. 5, and a Gorham flask with basket weave motif, date cipher for 1891, ht. 6 3/8 in.